A trailer recently began running in theaters for the animated film Planet 51, in which Dwayne ‘The Rock’ Johnson voices a white astronaut who lands on a world inhabited by little green aliens. The specter of white performers playing blackface is as old as cinema itself. So, the notion of actors of color portraying Caucasian characters onscreen might seem indicative of racial progress. In fact, however, it is yet another sign that when Hollywood retains leeway in how they portray black artists, even those with widespread popularity, they still prefer a white face. 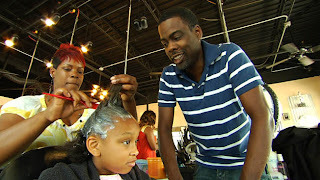 Such is the reality that partly fuels Good Hair, the debut documentary from comedian Chris Rock (and directed by longtime collaborator Jeff Stilson). Acting as the film’s master of ceremonies, gadabout, and truth seeker, Rock explores historical and cultural aspects of African-American – principally female – hair, the central focus being the decided tendency to equate ‘good’ or beauty with European or Asian hairstyles. The numbers are surprising and overwhelming. African-Americans comprise only 12 percent of the national population, yet purchase 80 percent of hair-care products. Rock likens this passion to an addiction, one he peruses with equal parts humor and seriousness. Although the documentary’s presentation is cut from the well-worn Morgan Spurlock cloth, Rock’s wit and cunning insightfulness enlivens even the most mundane tableaus, including an over-reliance on talking-head interviews with such celebrities as Nia Long, Maya Angelou, Ice-T, Reverend Al Sharpton, and many others. While the film’s format is familiar, Rock benefits by delving into subject-matter foreign to many viewers. Yes, Spike Lee once staged an inspired song-and-dance routine in School Daze in which rival female African-American groups debated between “Good or Bad Hair.” But, Rock goes much further, visiting beauty salons, barbershops, and hair industry conventions to examine the economic and intimacy dilemmas wrought by black women’s hair obsession. He spends much time researching the perils of traditional, common hair-straightening treatments and reveals the shocking expense of some hair ‘relaxing’ and extensions (although Rock would have you believe that every weave costs $1000 and up). He travels to India to track down the source for most non-synthetic African-American hair weaves. He even tosses in a bit of intrigue by following four teams vying to win the annual Bronner Bros. Hair Battle Royale in Atlanta. In the process, Rock offers clever commentary on what this pursuit of straight hair says about African-American cultural identity (and, to a smaller degree, the Indian women and merchants who supply the hair). Good Hair is not without its kinks. A Michael Moore-esque stunt in which Rock travels to various boutiques to unsuccessfully peddle actual African-American hair is wisely edited down to mere minutes of screen time. On the other hand, the trite competition climax drags on far too long. And, a slightly chauvinistic air occasionally wafts through: For example, Rock posits that some African-American men might prefer dating white women because of the intimacy impediments formed when black women forbid men from even touching their expensive coiffure; yet, he ignores the allure of the ‘white ideal’ that similarly motivates at least as many men. Still, in the hands of a less entertaining and astute performer, Good Hair could have come off as forced and preachy. Instead, Rock is a natural who weaves together a compelling conversation starter that manages to be both good-natured and informative.